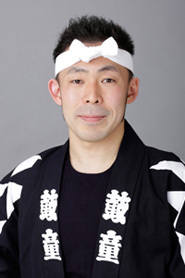 Shogo, the musical director for Amaterasu, will be on TBS Radio as a special guest. 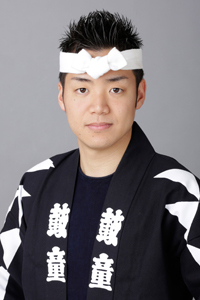 You can hear about his thoughts regarding the "Amaterasu" performances and his experience with Kodo. 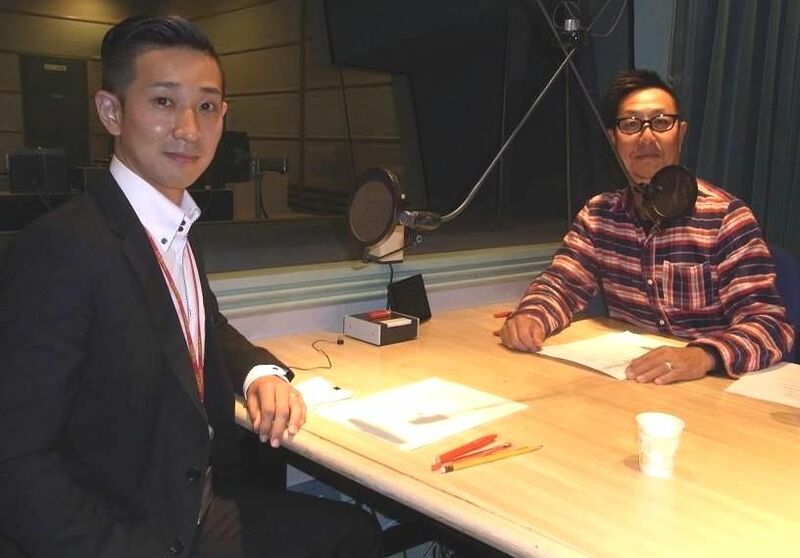 It was recorded yesterday and Shogo and the radio personality, Mr. Saito, took this commemorative photo together at the recording. 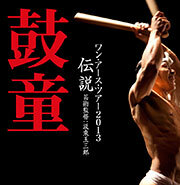 My recommendation is definitely "Onidaiko!" 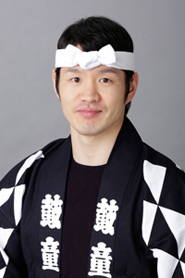 Onidako is a demon dance, but the demons are good ones, giving us abundant crops and good health. As a wish for your health, I will become a demon and perform with all my might. I hope you'll like it! this "Legend" tour with a range of parts from precise, delicate rhythms to the energetic collision of six individual personalities. Each day brings its own sound, and we play off each other in response to that sound with everything we have. Please come to the theater to witness this calculated form of improvisation. The 1st half & 2nd half contrast of stillness and motion. 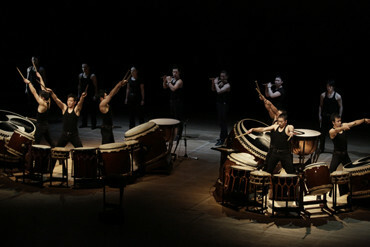 Especially, "Tsukimachi" in 2nd half is an energetic piece, which is an arrangement of Hachijo Daiko. 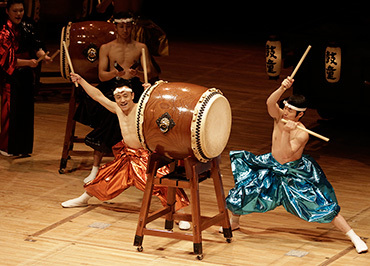 The rhythm is very worldy, so please look forward to the ensemble's sound when they beat both the skins and the rims of the taiko. You may be surprised to find the way drumsticks move to make such sounds. 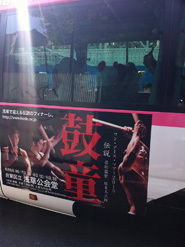 I recommend seeing Kenta playing "O-daiko." His body is like a marlin's, very strong and supple. His drumming produces roaring sounds and his simple, calm character creates a deep, flavorful rhythm. 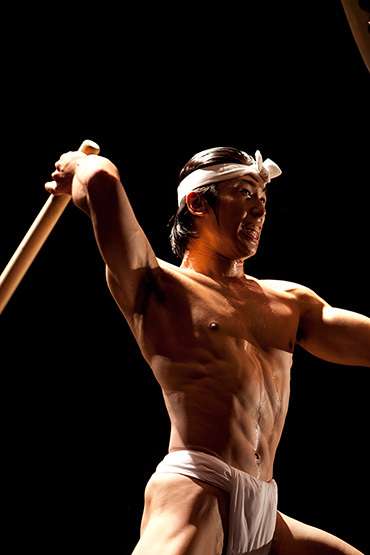 If you hear his taiko close-up, your heart will surely be roused! If you need more vitality for tomorrow, you must see it today! After lunch, Yoshikazu invited us to dance onikenbai. "I brought fans and bamboo sticks (instead of swords), so you can just come along and dance!" "Yes" is the only word I was able to say... Some of us (staff, not performers) got out of breath, but it was nice to be on the ground and to feel the wind outside. 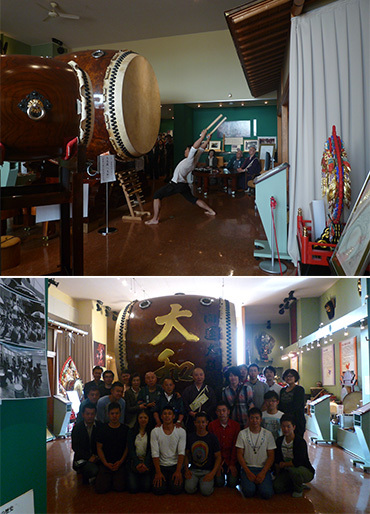 On the way to Toyama, we visited Asano Taiko, who make our drums. The priest of famous Yakushiji Temple in Nara was also visiting there unexpectedly and we were able to have him listen Kenta's o-daiko. Here is a commemorative photograph before we left! We performed with Miyakejima Geino Doshikai in their concert "Matsurine.” In this festival of men, the taiko performers were very dignified and I felt their perspiration was so cleansing. This "Legend" tour began around this time last year, and after touring abroad, now we are back on the road in Japan again. Our performance is more powerful than ever now, so even if you saw it last year, you'll find plenty to see if you come again. 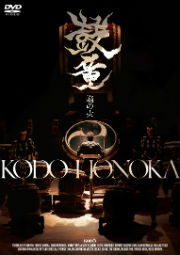 Please join us and experience the resounding echoes of our taiko, with the audience and Kodo as one. I like this feeling! 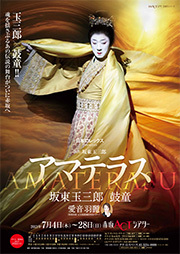 A program related to the "Amaterasu" performances will be on air soon in Japan. It features a segment where you'll see the unique personalities of various Kodo members, too! We hope you can tune in. This program was filmed at Kodo Village on wintery Sado Island in January, and we had a round-table talk with Tamasaburo. It is a rare opportunity to see his frankness. 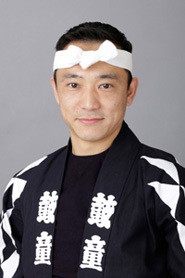 And, our rehearsal with Harei Aine, former Takarazuka Revue male role star, is featured, too. Don't miss it! 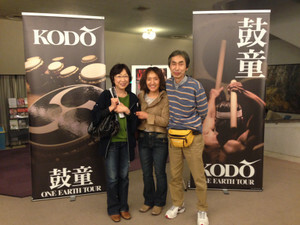 The Kodo One Earth Tour 2013: Legend is on the road now. Today, we've started a new series of posts to introduce the highlights of this performance through the eyes of our performers. The more you chew rice, the sweeter it tastes. The more you chew our performance, the sweeter… no, the richer it becomes. 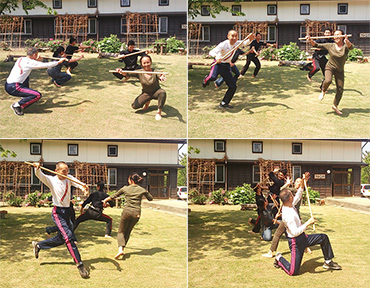 The new performers who joined Kodo last year have really grown, and all of us senior members continue to hone our own skills, not to be outdone. 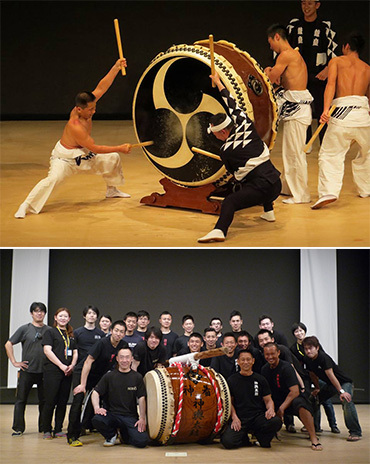 Check out "O-daiko" when you see the performance. It's interesting that the way each performer's energy is released as they play the big drum is different everyday. Kenta Nakagome plays first, then next up is Mitsuru Ishizuka who reacts to that drumming, undauntedly, in his performance. Then the third performer, new face Yuta Sumiyoshi comes in to take over and completely devotes his whole body to drumming towards the climax of the piece. Even just watching this from the wings really fires you up every time. 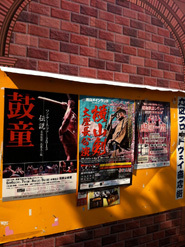 School Performances in Masuda City and Yoshika Town, Shimane. Every time we go to a school we are excited to see what kind of children are waiting there for us. 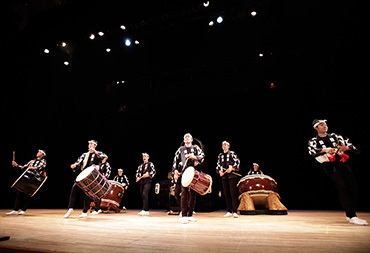 At these schools, the children laughed during the light-hearted pices, concentrated with wide eyes during Yosuke's O-daiko performance, and clapped along to the beat of the encore piece. The children react to us so freely, and it really gives us a boost! 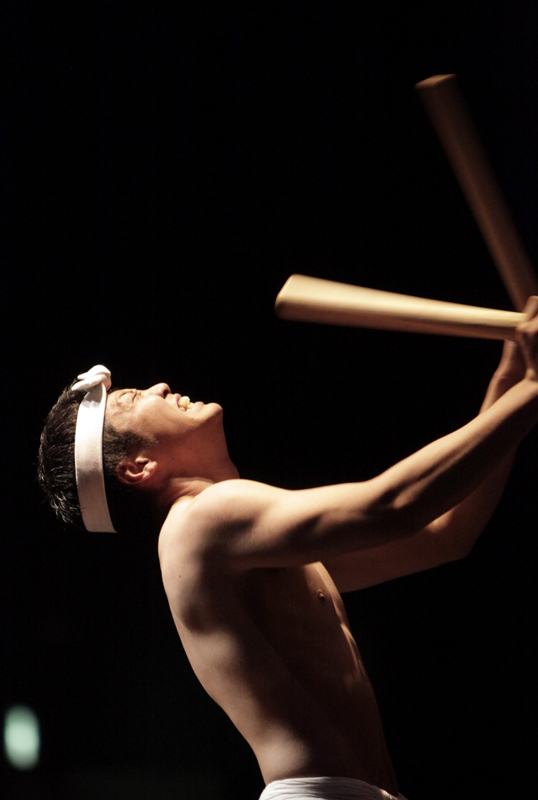 Kenta is making taiko drumsticks in anticipation of our collaboration with Miyakejima Geino Doshikai at "Matsurine." 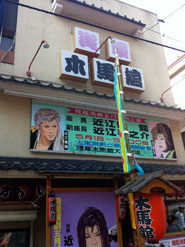 I saw many Kodo posters around Asakusa. 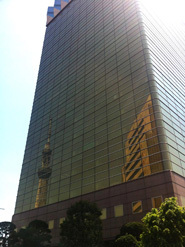 The famous new tower, “Tokyo Sky Tree” is reflected beautifully on the glass wall of the building. 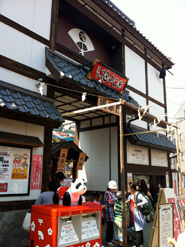 There are so many attractions to discover in Asakusa! 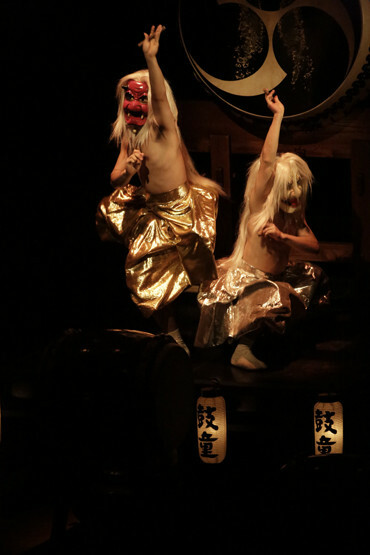 Kodo Workshop-Performance in Kawamoto Town. Kawamoto in Shimane is a town surrounded by beautiful mountains. 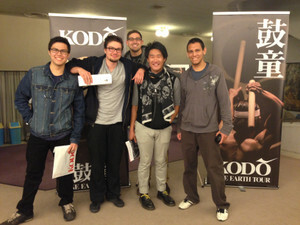 It had been 5 years since Kodo's last visit there. 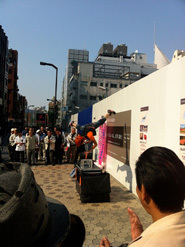 The weather was so sunny and the sound of taiko booming there had such a feel-good echo. In the finale of the concert, we enjoyed a lively performance with local taiko group Gogawa Daiko. 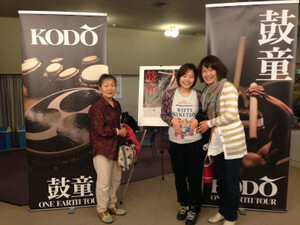 It was held as a pre-event for our Kodo One Earth Tour 2013: Legend performance. Eiichi gave a workshop to 5th and 6th graders from Miyano Elementary School. 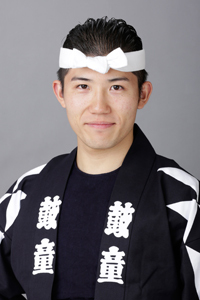 He was able to convey his heart to good school children who like taiko. 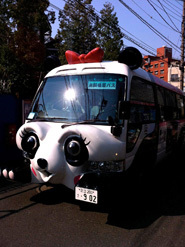 Asakusa is a fun place to find new things. 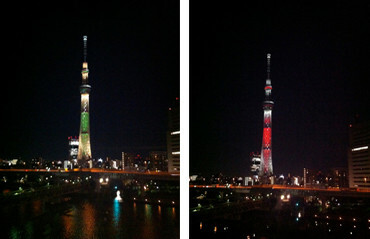 0ne day, I saw Tokyo Sky Tree with green lights and then another day, I saw it with red ones. They were so beautiful. 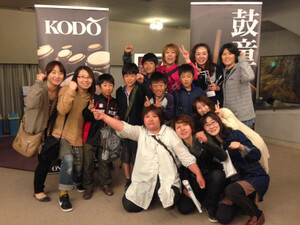 Thank you very much for coming to see our performance, everyone! 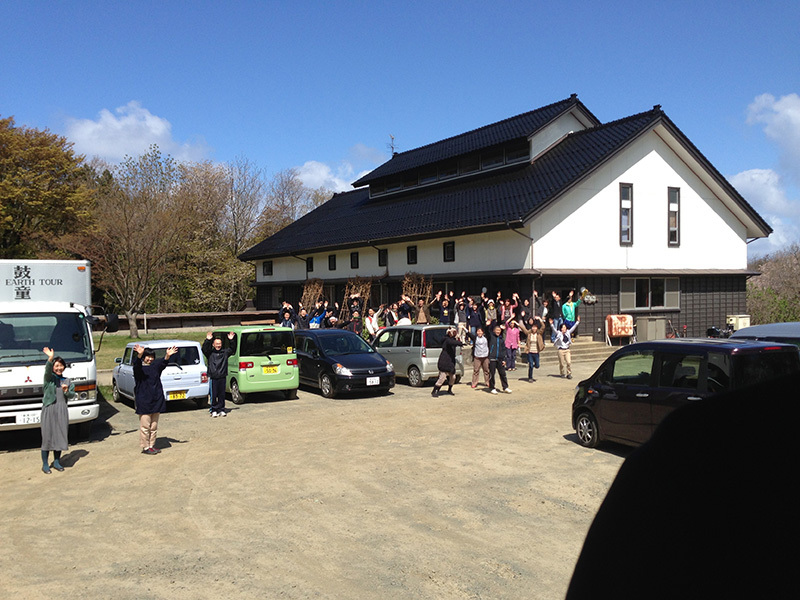 We left Kodo Village to begin our tours. We are looking forward to seeing all of you at the theaters! 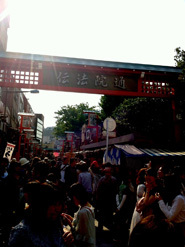 I walked around Asakusa today. 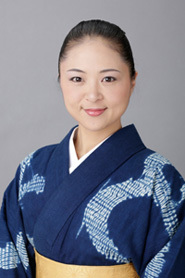 For more information about Asakusa, please check our monthly newsletter, Kodo eNews!